“A poor workman blames his tools” is an old saying among craftsmen. If you do not take care of your tools, it won’t just be an old saying… it will be true. Power tools especially, will not perform if they are allowed to deteriorate for lack of care. Proper care also means they will be safer to use. Here are a few things you can do to extend the life of your newest tool additions. When you buy a new power tool (whether it be a cordless drill, angle grinder, or even biscuit joiner), you want to be sure it’s not something that will need replacement only a few months down the road. The first thing you should do is actually fill out the warranty card (or online form). It only takes a minute and just might come in handy whether the motor burns out unexpectedly or the manufacturer issues a recall. Either way, you’re covered. Your new tool should have a home of its own, a place where it lives when you are not using it. Wherever its home, shelf, hanging tool rack, or drawer in your tool cabinet, it should be fairly clear of dust and dirt, otherwise you will have to invest some time in cleaning the tool. After each use of your power tool, clean it. Dirt and dust will accumulate and eventually damage the tool. Keep shops rags around to clean the tool after it has been used. Lubricate where and when the tool needs it, as directed in the literature that came with it. With proper lubrication, wear will be kept to a minimum. Check it after each use, to make sure that no parts are wearing such that they should be replaced. Always replace worn parts – a worn part will make others wear out prematurely. If you follow a few simple, logical rules, your tools will last a long time. 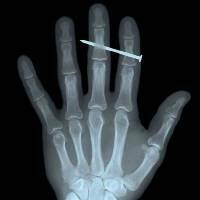 Do not use your tool for a job it was not intended to do – it will quite possibly damage it, and will certainly wear it out faster. Do not overwork your tool. This will wear it out faster than any normal use. Handle your tools gently. If it breaks in the middle of a job, your schedule will be thrown off because you will have to purchase a new tool. Not to mention that the new tool comes out of profit, not overhead. Make sure that anyone who uses your tool knows how to operate it safely and properly. Your power tools will work properly and safely if you check them often and make any repairs that may be needed for safe operation. NEVER use a power tool in wet conditions. Electrocution cannot be reversed. Do not use any tool that is not functioning properly until it is repaired. Be sure that anyone using the tool will use it properly and safely. Check the tool carefully before anyone else uses it. Keep a first aid kit nearby. As careful as you think you may be, accidents happen on occasion even to the best of us. 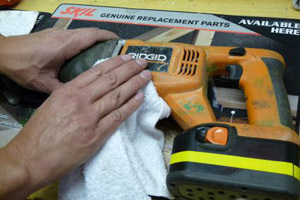 In general, common sense will help to keep your power tools operating efficiently and productively. All your tools need care, but the ones that use power to work require more attention than others, or, simply put, they will not work.